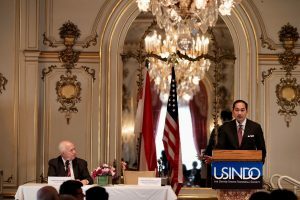 I am pleased to provide videos of USINDO’s 2019 Washington Special 2019 Presidential Election Series, designed to inform our Washington audience about Indonesia’s upcoming Presidential election. On February 5 our speaker was Pak Hashim Djojohadikusumo, designated spokesperson of the Campaign Team of Presidential Candidate Lt Gen (ret.) Prabowo Subianto and Vice Presidential Candidate Sandiaga Uno. On February 13 our speaker was Ambassador Muhammad Lutfi, designated spokesperson of the Campaign Team of President Joko Widodo and Vice Presidential Candidate Ma’Ruf Amin. The series was highly successful in giving our audience a better understanding of this important election. Please enjoy viewing these videos.